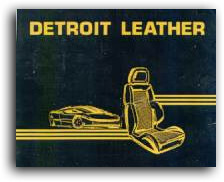 Original automotive leather is the same leather that is put in factory automobile interiors (domestic and some foreign) and is supplied by a source called Detroit Originals. This company receives the leather from different tanneries that dye hides to the specifications needed. Original automotive leather offers probably the widest choice of colors available with a matching vinyl most of the time. The option of a matching vinyl is beneficial to cut down the cost of using leather. Using a combination of leather / vinyl to upholster a seat, leather can be used for the area of the seat on comes in contact with when settled into the seat - called the "facing" of the seat. Then a matching vinyl can be used for the panels of the seat that will not be sat on - the "trim" panels of the seat. This way, one can have the luxury of leather when sitting in the seat with the least amount of expense as possible. Using Detroit Leather is an option that is specifically targeted for the automobile that has a damaged leather seating panel that needs to be replaced without replacing the entire seat cover. This can be especially advantageous for one that has a lease car with a damaged leather seating panel(s) and it is time to turn the car in. One area of concern is if it is just a panel or two and the upholstery is over a couple of years old, the color shade, skin texture and wear characteristics may not match up exactly. What Catalina Custom has had to do in some circumstances is have a professional leather / vinyl repair technician come in and dye the new leather to match more closely with what the original is. For further information or questions on Detroit Original Leather, contact us.